“In what seems like a throwback to the Cold War era in Southeast Asia, we have recently monitored the arrest of environmentalist Sherwin De Vera of Defend Ilocos by Philippine security forces last December and his subsequent charge of the crime of Rebellion; the judgment against anti mining activist Heri Budiawan (Budi Pego) by an Indonesian trial court last January for supposedly violating Criminal Code provisions on crimes against state security; and the inclusion just last week of environmental and indigenous rights activists in a list of alleged members of the Communist Party of the Philippines that the government has petitioned a judicial court to be declared as terrorists under its Anti-Terrorism Act.” said Romel de Vera, FoE APac EHRD Project Coordinator. “We see these government actions as attempts to stifle dissenting voices against widespread violations of rights of indigenous and rural communities as well as the opposition to corporate plunder of the environment and ancestral territories. These actions contravene the mandate to states by the Declaration on Human Rights Defenders to protect the rights of individuals working against violations of human rights and fundamental freedoms.” de Vera added. Khalisah Khalid, Head of Campaign and Network Department of Wahana Lingkungan Hidup Indonesia (Indonesian Forum for the Environment) WALHI/Friends of the Earth Indonesia said, “the silencing of the voice of the peoples who fight for ecological justice and social justice by the government is a setback for democracy and human rights. WALHI urges the government to protect environmental defenders”. 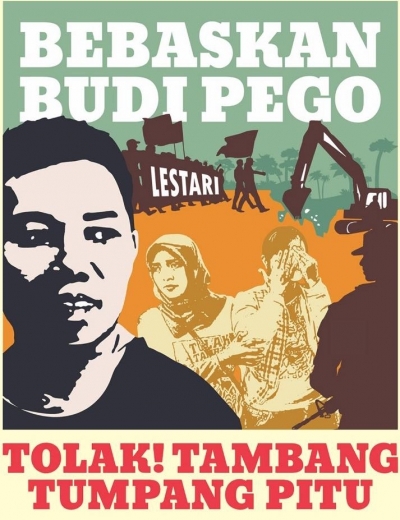 Heri Budiawan (Budi Pego) who was imprisoned after joining a demonstration against gold mining in East Java in April last year, was convicted for allegedly spreading communism by allowing “hammer and sickle” banners to be unfurled in the anti-mining demonstration that police alleged he led. Sherwin De Vera who is currently out on bail for his Rebellion case has also been included in the “terror list” of the Philippine government, along with Vicky Tauli-Corpuz the United Nations Special Rapporteur for Indigenous Peoples who called on the Philippine President last December against the effects of government military operations against indigenous peoples. Many other environmental and indigenous rights activists that have been network partners of the Legal Rights and Natural Resources Center – Kasama sa Kalikasan/Friends of the Earth Philippines (LRC-KsK/FoE-Phils) in the struggle for indigenous peoples rights in the Philippines are also in the list, including Joan Carling the former Secretary General of Asia Indigenous Peoples Pact, Beverly Longid of the International Indigenous Peoples Movement for Self-Determination and Liberation and Windel Bolinget the Chairperson of the Cordillera Peoples Alliance. “Past experience shows that communist and terrorist tagging by the state pose a serious threat to the safety, liberty and lives of those labeled as such. We only have to look back to December 3, 2017 when Datu Victor Danyan was killed in an alleged military operation by the Philippine armed forces against communist rebels in their area. Datu Victor led the struggle of the T-Boli-Manobos against the encroachment of the Consunji owned coffee plantations inside their ancestral territory.” said Norly Mercado, Executive Director of LRC-KsK/FoE Phils.